1. In a resealable plastic bag, combine the honey, mustard, oil and lime juice. Add the chicken and let marinate at room temperature for 20 minutes. 2. Meanwhile, in a large saucepan, combine the potatoes and enough salted water to cover; bring to a boil. Cook the potatoes for 20 minutes, then drain and let cool slightly. Slice the potatoes lengthwise into 1-inch wedges. Transfer to a bowl and gently toss with the olive oil; season with salt and pepper. 3. Preheat a grill to medium-high. Add the chicken and potatoes, cover the grill and cook for 10 minutes on each side. 4. 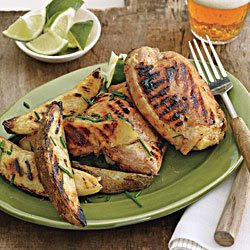 Serve the chicken with the lime wedges and potatoes. Sprinkle the chives over the potatoes.